In England currently the cold weather is big news and is drawing comparisons to the cold, brutal winter of 1962-1963, which is relevant to this blog in so many ways. In fact, in the Daily Mail article "Will it be even colder than the winter of 1962-3? Big freeze returns tomorrow... and it's going to last for a MONTH" by Paul Bentley, Becky Barrow and Sophie Freeman (how many Britons does it take to write about the weather? ), the boxed off text "The Great Freeze of 1962/63" seems a paraphrase of Sylvia Plath's prose piece "Snow Blitz." One of my favorite things to do is review the Times and Guardian microfilm from Boxing Day through early February to try to get a sense of what he media coverage was saying about the weather conditions. That the winter is still memorable speaks to its severity. Unfortunately we do not know the date "Snow Blitz" was written, but in all likelihood it was written before she completed what would be called "Ocean 1212-W." Another prose piece Plath wrote at this time was "America! America!," which was if memory serves a commissioned piece by Punch. 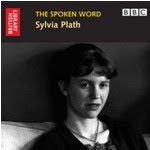 The recently released audio track of Plath's review of Donald Hall's Contemporary American Poetry anthology for "New Comment" on the BBC is another excellent example of her prose writing; and in a different genre to the previously mentioned works. One thing is for sure, Plath's late prose - like her last poems - was amongst her finest writing... And I do not think Alvarez was wrong when on 17 February he wrote, "[t]he loss to literature is inestimable." Thanks to Kim for the link! Even after all this time, I'm still digesting "Last Letter" but finding it easier to read now that the hoopla has died down a bit. The news stories on its publications were just atrocious and sometimes it is hard to shake initial feeds, impressions, reports, and rushed judgments. As a result, though, what was reported has to be discredited largely, and ignored & forgotten. Looking back to those long gone halcyon days of early-to-mid October 2010 and those news stories ... I can't read them anymore. They, in fact, they quite privately bore me...(in those days I regarded forgetfulness as an essential part of survival). I'd like to see the manuscripts of the poems, all of them. Hughes's handwriting is difficult at best, but a little time with them and I think much more could be known about the poem. That being said, this post isn't looking at the whole poem, but just a little bit of it. First, though, with this archive of material now available, this term Birthday Letters now means much more than the collection that was eventually published. In typical Steinbergian fashion I cannot and do not look at the poems in Birthday Letters as poems, but I will try to untangle some of the real events that may have inspired and informed the poem. I learned when Birthday Letters was published not to spout out as I still waver a bit on how I receive and interpret those poems and that book. Some have said the poem “Last Letter” doesn't fit: true, it feels unfinished and raw in some ways, but I don't know if that is because I was told it was unfinished or if its exclusion from Birthday Letters (and/or Howls & Whispers) makes it so. I do not have either collection memorized, but I do not recall Hughes coming as close to finding himself guilty, his behavior reprehensible - or pronouncing himself indeed as guilty - of something as he does in "Last Letter." This got me thinking about the possibility of an actual "Last Letter." Obviously, if there was one - and if the poem is to be believed as relating something that did happen - Plath burned it. What might it have said? Something strong enough to force Hughes to dash (not from Yorkshire as Walsh would have you believe) but from his flat at 110 Cleveland Street to 23 Fitzroy Road (driving about 2.1 miles; walking 1.5 miles). In the poem, Hughes writes, "—-off the ashtray / Against which you would lean for me to read / The Doctor’s phone-number." All reports indicate that Plath pinned or taped her - for lack of a better word - suicide note to "PLEASE CALL / DR. HORDER..." on the perambulator which she usually left in the hallway (much to her downstairs neighbor, Trevor Thomas’, dismay). Did she leave two notes? This seems unlikely unless what she left propped on the ashtray for Hughes to read was an actual letter and not a secondary note to call the doctor at the time of her death (let the speculation begin!). So this is an instance where Hughes is likely misremembering or taking some poetic liberties or both: it's neat this way, the note is placed in the exact spot where she burned her “last letter.” It's as neat and tidy as suggesting "Edge" is her last poem when it very well could have been “Balloons”. Speaking of “Edge”, I wonder if, as Plath burned the last letter, the “strange smile” she was wearing is taken from the perfected woman’s “smile of accomplishment”, if the smiles are one and the same? The eight lines commencing "My escape / Had become such a hunted thing" I read two ways: First, Hughes' escape from the marriage; that Plath was literally hunting for him; to find where her husband was living. Second, and actually perhaps related, is that once Hughes left her presence he felt like the prey to Plath's predator. For example, did Plath stealthily follow him to Cleveland Street and return there the following day? A surprise visit by Plath to Cleveland Street on the 8th or 9th of February (or perhaps before this date), I think, lends support to Hughes wanting to not sleep there during the weekend of 8-10 February, or at least explains his motivation to not be at his flat. In a comment by Kim also in the above mentioned post as Cath's, she pointed out something I said in Kara Kilfoil's annotation of "The Inscription" (published in Plath Profiles 3). I proposed "that Plath may have obtained Hughes's address when staying with the Beckers which would support an argument for Plath's visit to Cleveland Street on February 9 (see annotation 74.1) as opposed to February 7." Now, without a doubt, I believe Plath obtained Ted Hughes' address and telephone number at different times. Here's why... In her address book, now held in the Plath Collection at Smith College, Hughes’ name and address are in a different color ink (blue) than the phone number (black). Black ink was usually the color Plath used to enter information in her address book. I suggested what I suggested to Kara based on the different color inks. Blue isn't too unusual in the address book; however, it is not the norm. The black ink appears to be the same ink that she wrote her poems in and which she used to sign letters, etc. So, this suggests she obtained Hughes' telephone number whilst she was at her own flat in Fitzroy Road, maybe even from Hughes himself on a January visit. The blue ink is more typical ballpoint pen (or biro, as they are called in England) and I think must be the kind of pen she kept in her purse. It is a small detail but a very important one. The fact is we do not know when she obtained either Hughes’ number or his address; what we do know is that in a letter to Olive Higgins Prouty written on 22 January 1963, Plath wrote that she knew he was living in Soho. But we cannot know if Plath knew where in Soho the flat was. The reference to Susan as "dellarobbia" has sparked some confusion over the choice of word, myself included. I like Kim's point from the comments to the aforementioned post. However if we look at the words individually, della means "of”; and robbia, “madder". Of madder. Madder is defined as "a Eurasian herb (Rubia tinctorum of the family Rubiaceae, the madder family) with whorled leaves and small yellowish panicled flowers succeeded by dark berries; broadly: any of several related herbs (genus Rubia); 2a: the root of the Eurasian madder used formerly in dyeing; also : an alizarin dye prepared from it; b: a moderate to strong red." I see this connecting to the previous lines above where Hughes goes on about the his “love-life” and its "mad needles." Someone suggested that the two mad needles were Assia and Susan; I think this makes sense as Plath cannot really be considered to have been, at this point at any rate, any part of Hughes' “love-life”, right? The image of "red" appears throughout the poem in words like “rose" and "bloody." Even "inside my own skin," "emblazon," and “fury” connote redness, something vibrant, brilliantly colored. Lastly (or firstly in the poem) Plath’s locked door, Hughes says, is red. Red is a very Plathian color and I should not have any need to cite examples from her work. Red also is a mythic color throughout Birthday Letters; the final poem was titled “Red.” In “Red” Hughes acknowledges Plath’s preference for that color, but he thinks “blue was better for your...was your kindly spirit” (BL 198). So in Hughes’ color-coded scheme for his women, Plath was blue, Alliston was red. (What of Assia Wevill? Brenda? Jill? Emma?) Can’t you just picture the official Ted Hughes limited edition Crayola box! In the penultimate stanza, Hughes writes, " I count / How often you walked to the phone-booth / At the bottom of St George’s terrace [sic]." This has to be a memory from the lost or destroyed journals or if she had a 1963 tablet calendar like her 1962 Royal Lett’s, perhaps she made notes on that? Perhaps she ticked them off as a prisoner might do in a jail cell to mark the passing days. I do think Hughes here is story-telling that Plath made so many trips to the phone box on her last night: 'Before midnight. After midnight. Again. / Again. Again. And, near dawn, again." As Cath again has rightly pointed out, Trevor Thomas says, "I could not sleep and I heard her walking to and fro on the wood floor." It has long been said that Plath was pacing the floors. Had she been traveling up and down the stairs and in and out of the door, Thomas would likely have been altered to this and deeply bothered. He would certainly have approached her. (At least, his portrayal as an intolerant, fussy old man would have us believe he would have.) It is not likely Plath left her flat that night for several reasons, the leading reason is that the letters for which she bought stamps were not actually mailed. Thomas reported that she seemed drugged, so we can be reasonably assured Plath took her sleeping pills and maybe even her "wake-up" pills. Anne Stevenson and others report that Dr. John Horder visited Plath Sunday evening, too. (How Horder knew she was back at her flat is certainly a question worth pondering. My best guess is that the Becker’s called him? Perhaps Horder “administered” her sleeping pills as Becker had done the few previous nights?) By the morning of the 11th, she was at least clear enough in mind to protect her children from the gas (also, I think she would not have left the children alone in the flat at night for repeated visits to the phone box). All this said, what of this "Last Letter"? It is possible that Hughes might have leaked some of the contents of an actual “Last Letter” to Aurelia Plath (should one have existed in the first place). In Hughes’ first letter to Mrs. Plath after Sylvia Plath's death, dated March 1963, he writes, "The particular conditions of our marriage, the marriage of two people so openly under the control of deep psychic abnormalities as both of us were, meant that we finally reduced each other to a state where our actions and normal states of mind were like madness. My attempt to correct that marriage is madness from start to finish. The way she reacted to my actions also has all the appearance of a kind of madness -- her insistence on a divorce, the one thing in the world she did not want, the proud hostility and hatred, the malevolent acts, that she showed to me, when all she wanted to say simply was that if I didn't go back to her she could not live...” (emphasis mine)"
N.B. The publication of “Last Letter” and the opening of the archive at the British Library will go a long way to unlocking Ted Hughes’ process of creating Birthday Letters; into the decisions that went into completing and selecting some poems, and the opposite, excluding other poems. Though I do not think that it was not acknowledged in news stories at the time, some Hughes scholars have known about the poem for years. And, hints about “Last Letter” had been available online for at least 11 months prior to the poems publication in the New Statesman. In an essay by Roy Davids called “The Making of Birthday Letters” the draft/variant first line of “Last Letter” “What did happen on that Sunday night?” appears in a list of first lines and titles of poems of Ted Hughes archive that he had worked with well before it sold to the British Library. Davids wrote the essay between 2007 and 2009 and it can be read on his website here, and with slightly different text on on Claas Kazzar’s wonderful ted-hughes.info here (published circa 12 November 2009). Other first lines are tantalizingly provocative, such as 'The last I had seen of you was you burning / Your last farewell note...' which may be another part/draft/version of “Last Letter” or indeed another poem altogether; and 'You never meant it. In your novel...' Meant what? Which novel!? If I had any desire to travel to London to see this stuff first hand it has now been magnified thanks to Davids’ wonderful essay which provides a rather deep glimpse into the archive. Kay Loftus of the Boston University Quad wrote "'The Last Letter' of Ted Hughes" which appeared on November 7. The New Statesman's Lucian Robinson posted "Ted Hughes's 'Last letter': the response" on November 22, 2010. From November 28, 2010, there is Peter Steinfels Commonweal piece "Is light the new dark?" which may be one of the first times Harry Potter and Sylvia Plath were mentioned in the same breath? Our friend in Plath - David Trinidad - has a poem entitled "Black Telephone" published in this year's Best American Poetry (edited by David Lehman and Amy Gerstler). David sent the following "Process Note" to me about his "Black Telephone," which originally appeared in Tin House. "The actual telephone that inspired this poem is in an unwatchable Natalie Wood film from the early sixties, Cash McCall. There's a closeup of it at the beginning of the movie. But I had telephones on the brain; that’s why it captivated me. I was in the middle of writing an essay about the telephone incident that precipitated the end of Sylvia Plath and Ted Hughes's marriage (Plath pulled the phone cord out of the wall when she intercepted a call from Assia Wevill, with whom Hughes was having an affair), and the way that incident reverberates in such poems as Plath’s "Words heard, by accident, over the phone" and "The Fearful" (and even "Daddy") and Hughes's "Do Not Pick Up the Telephone." Thus I was thinking about the telephone as "trauma object" (Catherine Bowman’s term) and as an instrument of terror in movies like Sorry, Wrong Number and Midnight Lace. So deep was I into research about Plath and Hughes, I knew that their Devon telephone number, before Plath severed the connection in July 1962, was North Tawton 370; after it was reinstalled a few months later, in early November, it changed to North Tawton 447. I was astounded to realize that Plath was without phone service when she wrote the bulk of her Ariel poems that October, a fact that explains, in part, the urgency of the work. 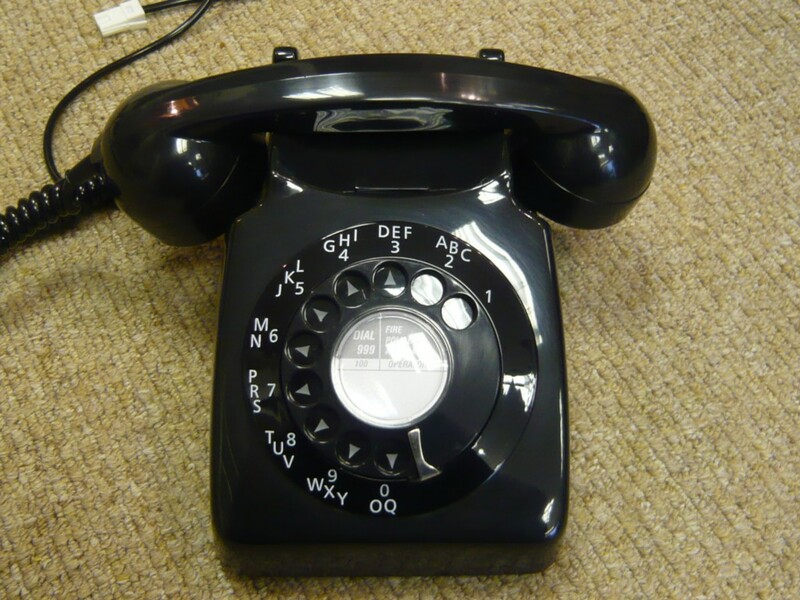 "Certain that Plath would have appreciated my attention to detail, I had to find out the model of her telephone. 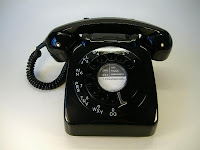 It would have been from the 700 series (706, to be exact), available in Britain from 1959 to 1967; "subscribers" rented their phones from the General Post Office, and had to wait several months to have them "fitted" by a GPO engineer. The interval, then, during which Plath was cut off from the rest of the world, which ironically helped facilitate her great poetic output. Of course once I knew the model, obsessiveness (or should I say fetishism) led me to Ruby Tuesday, a store in Shropshire that sells vintage telephones on eBay. From them I bought (for £65, plus another £30 for postage) an example of the very phone Sylvia angrily ripped from the wall. It sits here on my desk, magical by association, and beautiful (to my mind) in its shiny black obsolescence." Congratulations David! Read the poem here. The black telephone images here are supplied courtesy of David Trinidad. 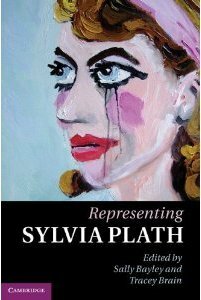 Trinidad, as you may know, had three poems published in Plath Profiles 3 and the essay “Hidden in Plain Sight: On Sylvia Plath’s Missing Journals” in Plath Profiles 3 Supplement this year. If you haven't read these poems and the essay yet, please treat yourself this weekend.